Perennial tufted, rhizome-bearing herb to 1.85 m tall Leaves: borne along the culm, with hairless sheaths and ligules that are 0.7 - 1 mm long, membranous, and lined with hairs along the margins. The blades are 7 - 22 cm long, 4 - 22 mm wide, flat, and often hairless but occasionally soft-haired on the upper surface. Inflorescence: 8 - 35 cm long, open, with nodding branches. Fruit: a laterally compressed caryopsis, 2.9 - 5 mm long, usually not exposed when mature. Culm: to 1.5 cm long, 2 - 4 mm across at the nodes, usually unbranched. 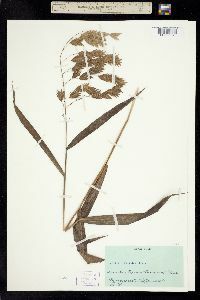 Spikelets: 1.5 - 5 cm long, 0.6 - 2 cm wide, laterally compressed. Glumes: nearly equal, hairless, with a five- to seven-veined lower glume 4.2 - 9.1 mm long and a five- to nine-veined upper glume 4.7 - 8.7 mm long. Florets: six to 26 per spikelet, with one anther 0.4 - 3.5 mm long and two reddish purple, feather-like styles. The lowest one to three florets on a spikelet are sterile. Lemma: of fertile florets 9 - 12.5 mm long, straight, hairless, eleven- to fifteen-veined, with rough- to hairy-winged longitudinal ridges. Palea: 4.6 - 7.7 mm long, hairless, swollen on one side near the base, with two winged longitudinal ridges. Habitat and ecology: Rare on shaded floodplains. Etymology: Chasmanthium comes from the Greek words chasma, meaning yawn, and anthos, meaning flower. Latifolium means wide-leaved. This is an open woodland species and is found mostly in our southern counties although Miss Madge McKee found it along the Iroquois River in Newton County. It is found in greatest abundance in slightly acid, hard clay soils of the bottomlands. It occurs, however, in upland woods and even on the rocky cliffs along the Ohio River.